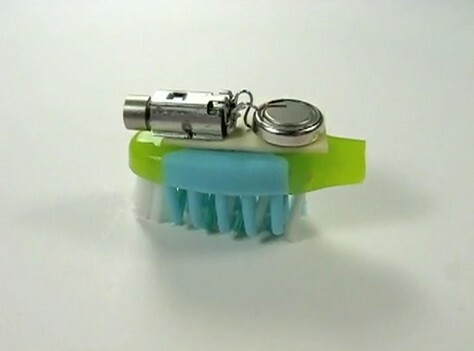 Pager motors – these are the tiny motors you find in mobile phones and…pagers. (They have an offset weight on the drive shaft which makes them vibrate) Best place to get them is from ebay – the deals vary but my last lot cost £25 for a hundred. Make sure you buy ones with wires attached as you really don’t want to get into small children messing with hot soldering irons. Unless they are really annoying. 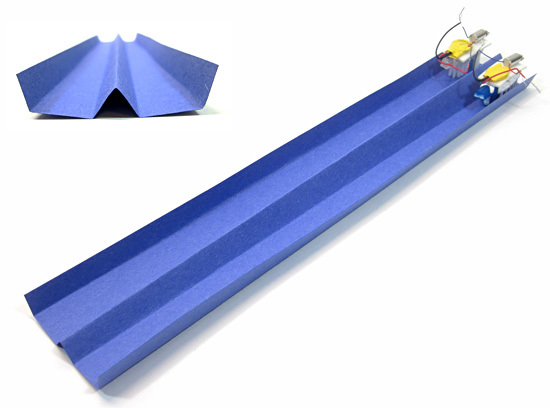 Double sided sticky foam strip – is best but blue tak is OK as well. Something to chop the handles off the toothbrushes – depends what you have and what works for you. I actually used a toe-nail cutting scissors as I don’t happen to have a workshop in my bedroom but I’m sure DT teachers can improve on that. To slant the bristles, stand your toothbrush in a jug of almost boiling water. (‘Almost boiling’ is an engineering measure, not a physics measure, by the way, and this is an engineering project!). DO NOT CHOP OFF THE HANDLE UNTIL YOU HAVE DONE THIS BIT! (I speak from experience!). Fish it out after a few minutes and bend the bristles by pushing the brush-head over something smooth and flat. I used a plate, which had a few sandwich crumbs on it, but worked extremely well. Bash it against the plate for good measure if the bristles are not splayed out. Then plunge the brush into a cup of cold water – even better if you can be bothered to find ice cubes – and leave for a few minutes. You might want to explain the chemistry of this. On the other hand you could suggest they ask their chemistry teacher – especially if you don’t like the chemistry teacher. 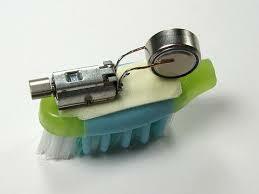 Cut off the handle of the toothbrush just after it pokes out of the brush head (another engineering measure). Stick the foam (or blue tack) to the top of the brush. Stick the motor to the non-handle end of the brush. Make sure that the spindle with the weight is overhanging and not touching the foam (Doh!) – and the wires are pointing to what was the handle end. Stick the watch battery on the handle end with one of the motor wires underneath the battery. Fiddly – I used a tiny strip of gaffer tape (another engineering basic) but I’m sure there are better ways you could dream up. Check to see if you brushbot actually stands up at this point and tweak if it doesn’t. Finally, stick the other wire to the top of the battery. This is fiddly – I used a tiny strip of gaffer tape (another engineering basic) but I’m sure there are better ways you could dream up. and let it go on a smooth surface – I used a tray. It will start vibrating as soon as you make the connection and as the basic bot has no switch, you need to stop it by unsticking the masking tape. It will work first time – but never as you want it to. This is where the freezer bag ties come in. Wrap one under its ‘body’ and twist at the top. Tightening or loosening the tie will increase the pressure on the motor and alter the vibration. You can also fiddle with bits of blu-tak to weight the Brushbot in different places. Or trim the bristles with a nail scissors. Or re-soak the bristles in hot water (use a tweezers or tongs this time!) and adjust the rake of the bristles. Make simple mazes out of anything that comes to hand and see if you can get your bot through it in shortest time. Folded paper worked for us. Can you make the bot that goes in the straightest line? What happens if you trim the legs shorter? How many can you get going at once? Fight to the death – put two bots in a small flat container – I used a box lid about 4cm square as the arena and the probability of them bashing each other is quite high. See who gets killed first. Do the same in a china dish. Because there is no switch, kids will leave the batteries on rather than un-sticking the connection and the battery life is about 30 minutes for the batteries I was using. Problems actually getting the bot to stand up. The ONLY solution is to fiddle around. This is why you need to splay the bristles out as it improves stability but also decreases speed and less likely to topple when it hits something. The compromises top design engineers have to make…. If you do have to buy toothbrushes, get the multipack cheapest ones – they work better than the sophisticated ones with dots and ridges and other over-engineered features. Tomorrow – assuming I’m still far too ill to actually work – I am going for the programmable one. Or at least one with a switch. Then I wonder if I could progress to a nail brush? A scrubbing brush? A broom head…..watch this space! The original EMS design is shown here (thanks to Jeff Proctor) – mine was very similar but I’m glad I was ill and couldn’t rush out and buy the toothbrushes he recommends. I had far more fun with the old ones and learned more – hence the hints. And thanks to science buddies for picture of race track!